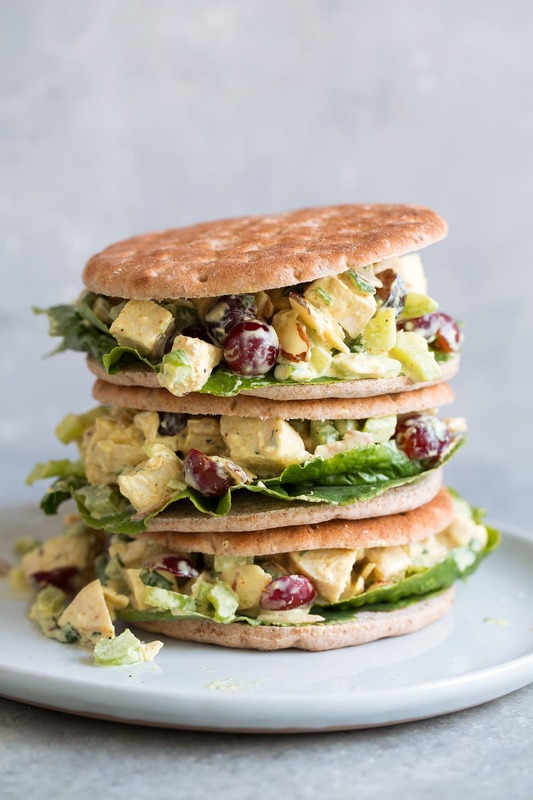 Curry Chicken Salad is a step up from the classic chicken salad because it’s brimming with those flavorful Middle Eastern spices. It’s also lightened up by using Greek yogurt in place of most of the mayo. It will leave people wondering what makes it so good! With most of the Curry Chicken Salad Recipes out there, you’ll find that they call for “curry powder.” I’m actually not a big fan of pre-blended curry powders for a number of reasons. They are all different among each brand, so if I tell you to use curry powder but my curry powder had 4 different ingredients, then yours it’s not going to taste the same. I also prefer to add as much heat as I like (because my kids don’t tolerate it well), and most curry powders are SPICY! So a homemade blend it is, and it’s perfectly fitting for this homemade chicken salad recipe. 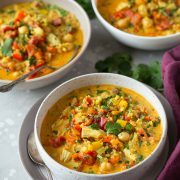 This blend uses coriander, cumin, ginger, turmeric, cardamom and/or nutmeg, and cayenne. 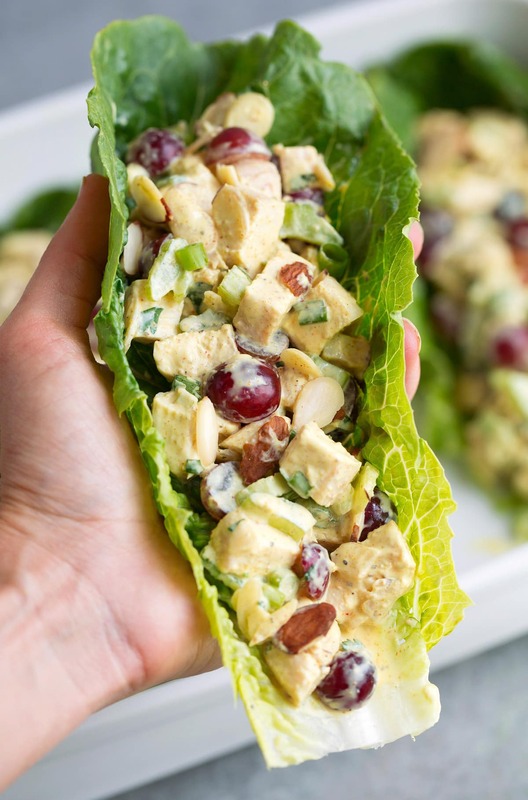 I love eating this curry chicken salad as a sandwich or as lettuce wraps. If you are looking to cut carbs, go for the lettuce wraps. It still makes such a filling lunch with fewer carbs and calories. Either way though, you’ll end up with a perfectly tasty and satisfying lunch! If you don’t already have leftover cooked chicken, then you can either use rotisserie chicken or roast chicken breasts yourself. To do so, preheat oven to 400 degrees, spray a rimmed baking sheet with non-stick cooking spray. Pound chicken breasts to an even thickness and brush lightly with olive oil, season with salt and pepper, then roast in preheated oven 15 – 20 minutes until breasts register 165 degrees in center. Chill completely, then dice. Whisk together all of the dressing ingredients in a bowl. 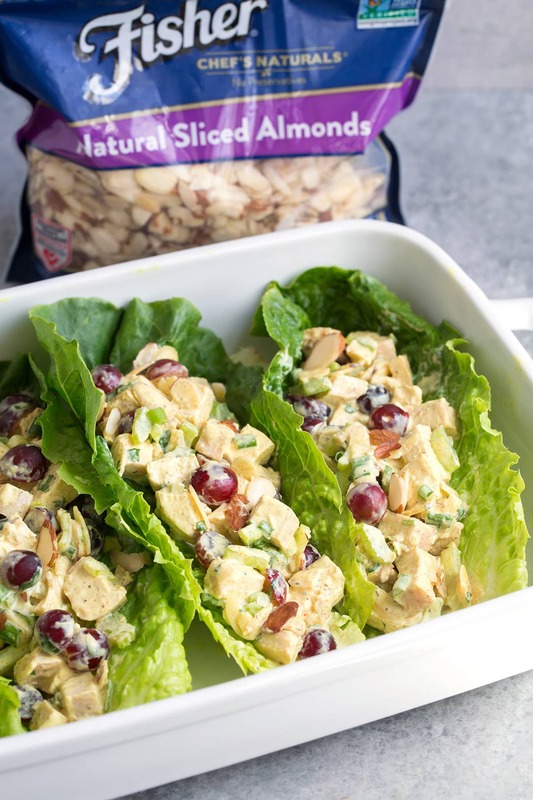 In a separate bowl, add all the chicken salad ingredients, including chilled cooked chicken, celery, grapes, green onions, sliced almond and cilantro. 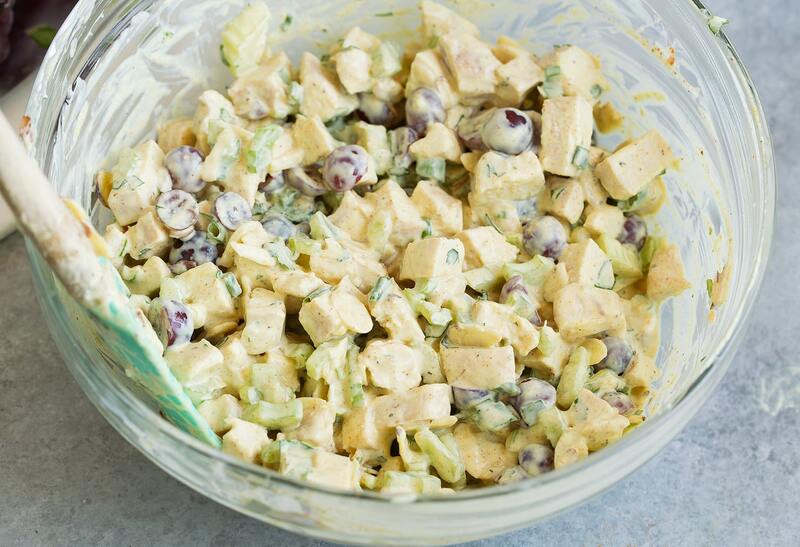 Pour the dressing over the chicken salad and toss to evenly coat. Serve in bread, croissants, bagels, sandwich thins, pita, over naan, in a tortilla or as lettuce wraps. Can I Use All Greek Yogurt in the Dressing? Yes, you can make an all yogurt dressing if you’d rather omit the mayo. The few tablespoons of mayo add lots of flavor though, so I recommend using it if you have it on hand! 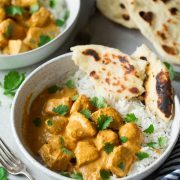 Can I Use a Pre-Made Curry Powder in This Recipe? Yes, of course. Although I can’t guarantee that your curry chicken salad will taste the same as mine! 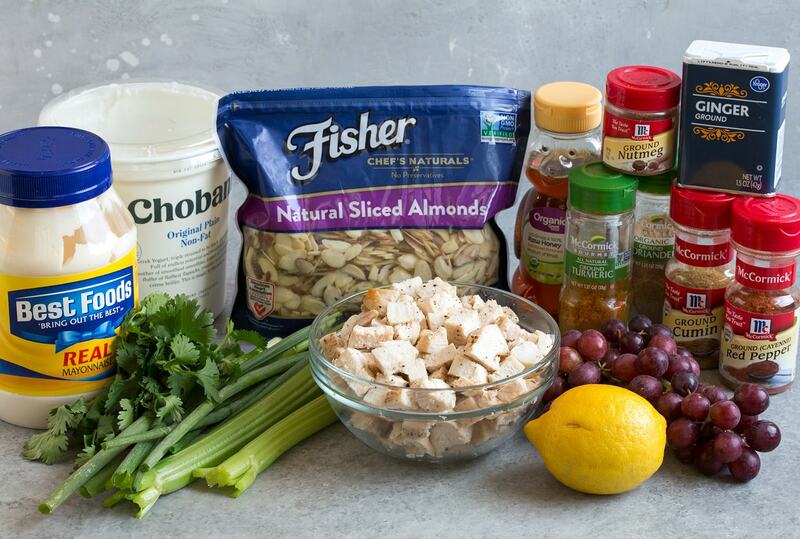 For this easy chicken salad recipe, I use Fisher Almonds. They are my go-to brand for almonds (for dinners, snacks, desserts and everything in between). This is my third year in partnership with Fisher! I choose to work with Fisher because I love the quality and flavor of their products, and I love that their nuts are preservative-free and non-GMO project verified. I also love the convenient stand up resealable packaging that helps the nuts stay fresher longer. You can visit www.FisherNuts.com for more recipe inspiration. You can also purchase them on their Amazon Page. Cilantro is totally optional, but it adds a pop of freshness to this curry chicken salad. Homemade chicken salad can be made up to a day in advance and keeps well in the fridge. 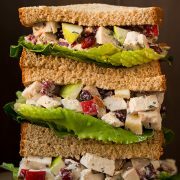 This chicken salad recipe can easily be doubled to feed a crowd. 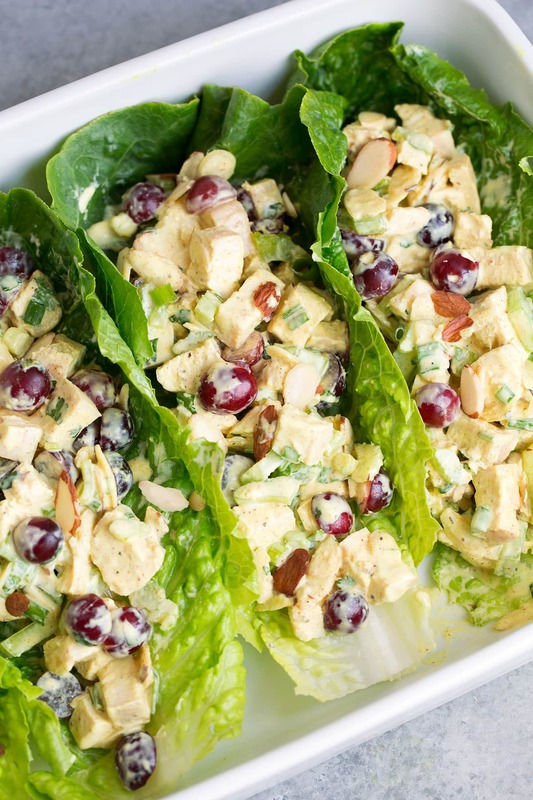 This is a deliciously flavorful twist on the classic chicken salad! It's taken up a notch with those aromatic Middle Eastern spices, and it's lightened up by using Greek yogurt for most of the mayo. Perfect served in bread or lettuce leaves. 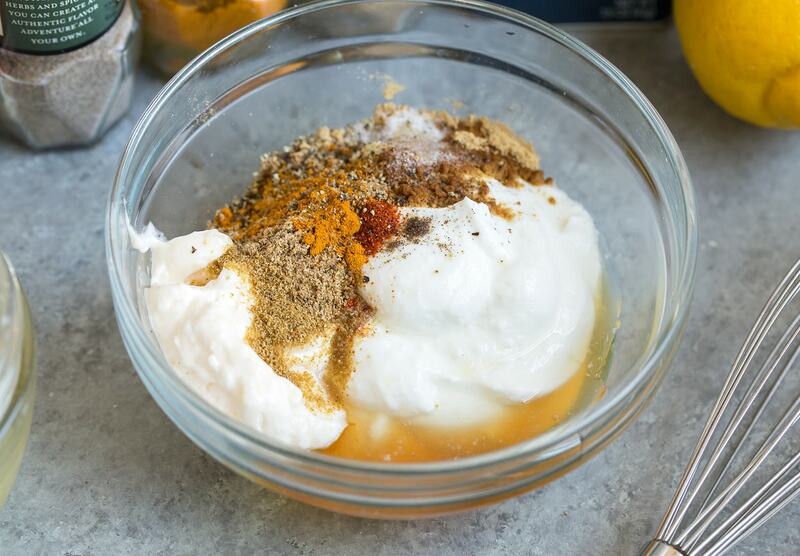 In a small mixing bowl whisk together Greek yogurt, mayonnaise, lemon juice, honey, coriander, cumin, ginger, turmeric, cardamom and cayenne pepper. Season dressing with salt and pepper to taste. 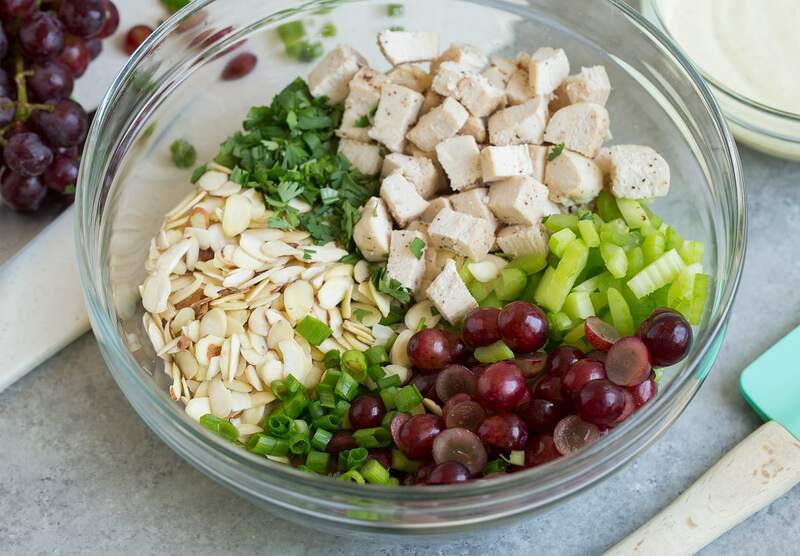 Add chicken, grapes, celery, almonds, green onions and cilantro to a large bowl then pour dressing over top. Toss to evenly coat. Serve in lettuce, whole wheat tortillas, croissants, bread, etc. Great recipe that we will definitely have many more times. Made it exactly as the recipe called for and wouldn’t change a thing next time. Spice selection was much better than just using curry. I did make the dressing an hour before putting all together.